Don't you love how superheroes' names tend to tell us what they're all about? Catwoman: woman with cat powers. Incredible Hulk: incredibly large. Green Arrow: wears green, shoots arrows. See? Direct and a real time saver. Okay, okay, so the character we're meeting today might not be a superhero, strictly speaking. But like one, she does have a nice, straightforward name that makes it pretty clear what her deal is. Introducing . . . Massacre Girl! No one knows much about Massacre Girl beyond her penchant for gratuitous violence, but she's been murdering her way around Ravnica for quite some time. She's widely believed to be a powerful member of the Cult of Rakdos, a theory supported by her skill at stoking chaos and igniting riots. Quite unlike, say, a Dimir assassin, Massacre Girl makes a spectacle of her kills. She revels in the shock and revulsion her grisly scenes induce. She kills for pay, for fun, for any reason she can dream up, and despite her impressive list of crimes, the Azorius have never managed to arrest her for a single one of them. Maybe that's due to an apparent abundance of imitators. 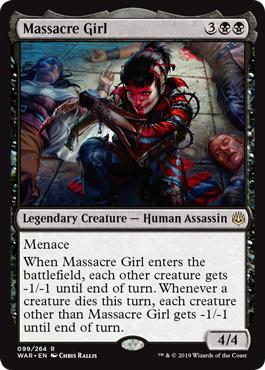 The flavor text on Thrill-Kill Assassin from Return to Ravnica hints that, as Massacre Girl grows more and more notorious, other Rakdos members have started basically cosplaying her. Very authentically. Including the murder part. For the lawmages, perhaps it's like looking for a needle in a big pile of needles that all want to kill you. It's also possible that she has (or at least had at one point) a powerful friend among the Azorius. For a time, she was mysteriously considered "untouchable," despite being at the top of the Ten Most Wanted list. And then there was that time all records related to her were conveniently destroyed in a fire. And now we've got proof that she's still at large, killing and rioting as enthusiastically as ever. With the war spreading violence across Ravnica and occupying the attention of the Azorius, she's probably having the time of her life. It's good to know someone's having fun out there. I think Massacre Girl would be proud to be represented by this battlefield-devastating card, and I can't wait to bring her out and massacre my opponents' board states.